Heroes and Victims explores the cultural power of war memorials in 20th-century Romania through two world wars and a succession of radical political changes—from attempts to create pluralist democratic political institutions after World War I to shifts toward authoritarian rule in the 1930s, to military dictatorships and Nazi occupation, to communist dictatorships, and finally to pluralist democracies with populist tendencies. Examining the interplay of centrally articulated and locally developed commemorations, Maria Bucur's study engages monumental sites of memory, local funerary markers, rituals, and street names as well as autobiographical writings, novels, oral narratives, and film. This book reveals the ways in which a community's religious, ethnic, economic, regional, and gender traditions shaped local efforts at memorializing its war dead. Bucur, Maria. 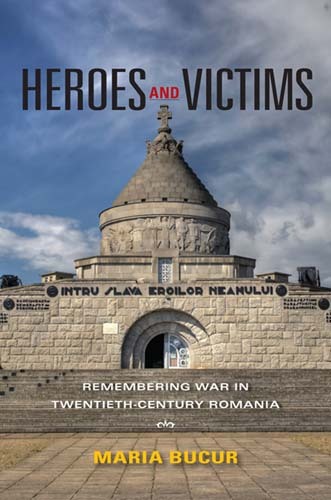 Heroes and Victims: Remembering War in Twentieth-Century Romania. Bloomington: Indiana University Press, 2009. Print.